Ten people were killed, one went missing and three others were injured due to heavy rains and floods in the central region as of December 4, according to the National Steering Committee on Disaster Prevention and Control. Of the dead, six were in Binh Dinh province and four in Quang Ngai. The missing one is in Quang Ngai while the three injured in Binh Dinh. Flash floods collapsed 51 houses and submerged thousands of others while damaging more than 11,000 hectares of rice and other crops, and killing dozens of thousands of poultry and livestock in the provinces. They also caused landslides in several areas, damaging thousands of kilometres of roads in Quang Nam, Binh Dinh, one bridge in Mo Duc district, Quang Ngai province, together with many irrigation dikes and canals. According to the Thua Thien – Hue Steering Committee on Disaster Prevention and Control, more than 1,300 households were around half-metre under water, mostly in Phu Vang and Phu Loc districts. 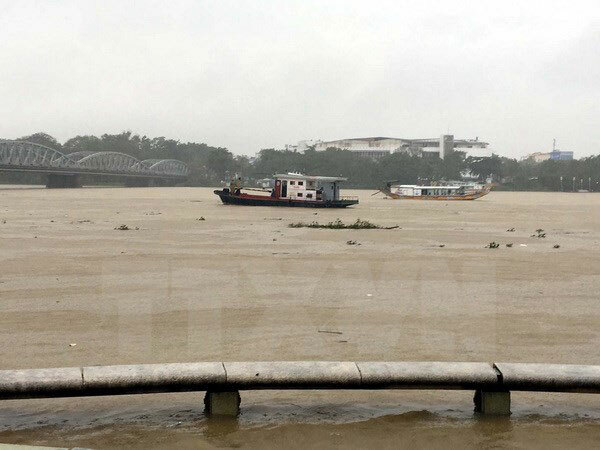 Landslides also hit in several sections of national roads in the province, Huong river banks and the coast, threatening hundreds of coastal households. According to the National Centre for Hydrometeorological Forecasting, Thua – Thien Hue may be hit by heavy rains and flash floods from December 5 – 9. Therefore, the National Steering Committee on Disaster Prevention and Control issued a dispatch to all relevant provincial committees to actively respond to the situation while continuing their search and rescue work and providing support for the families with the dead. They should increase supervision and patrol of landslide-hit areas and urge vessels working offshore to take preventive measures./.